In 2001, The Federal Reserve System published its first retail noncash payments study in 20 years. Since then, it has released three additional payment studies: one in 2004, covering the period 2000 through 2003; another in 2007, encompassing 2003 through 2006; and most recently, 2010, for the years 2006 through 2009. 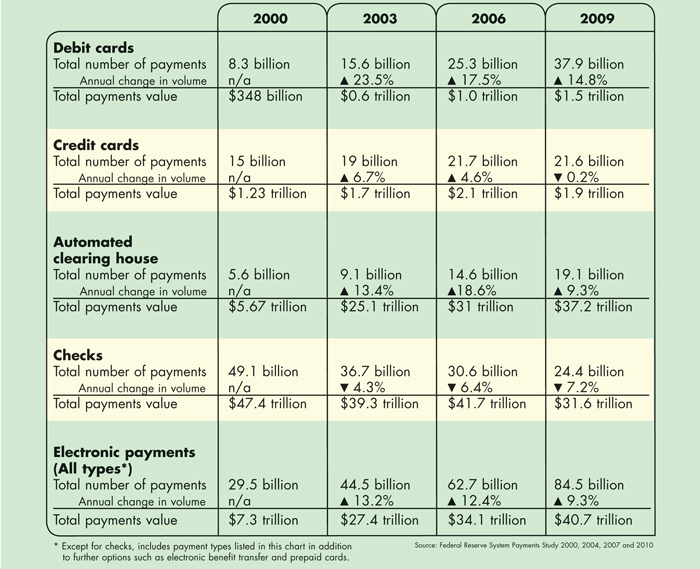 As you can see from the following chart, a significant change in noncash payments is the ascension of debit card use, surpassing credit card use in 2006 and check payments as of 2009.